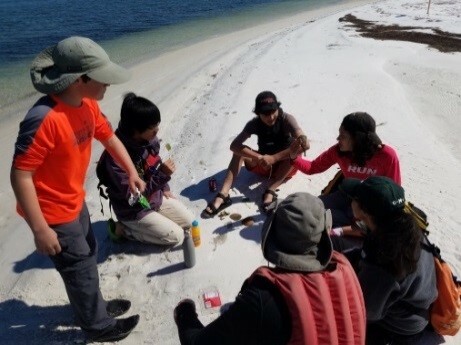 Each year, BCCC members ventured down to Florida during the spring break to paddle the numerous rivers, to explore wild life, and to be with each other. We have paddled the West coast, Central, South, and this year the North Florida panhandle. If there is one picture that captures the essence of our paddling trip, this picture attached must be it, of our young members sharing time and experience with us. This year we managed to involve Parker, Kevin, Sarah, Eoin & Alice in the paddling adventure, with Parker and Sarah as first time kayak paddlers. There were 23 members and two guests (Rachel and Mei) that participated in the paddling on various rivers during the week. New to the annual adventure are Barbara, Michael, and Chris. Each day began at Newport Park Campground in Crawfordville. The park provided the barest essentials for our base camp. The Gainers wimped out of the elements to stay in their house, while AJ and Leanne managed to snag a beautiful vacation home in Panacea. Cindy and Patrick brought their new tear drop camper for its inaugural paddling trip. The rest of the members managed between A-Liners and tents. For the week, we have paddled the St Marks River, the Wakulla River, the Wacissa River, the Aucilla River, the Spring Creek, the Chipola River, the Econfina Creek, and the St George Sound. We saw an assortment of the usual wildlife – alligators, manatees, ospreys, hawks, ibis, coots, conches, and starfish. Limpkin was a rare wildlife find this year. 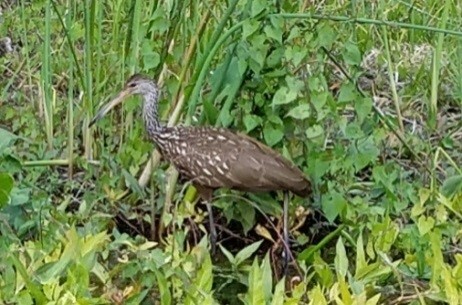 We spotted this lone limpkin on the Wakulla Springs. The limpkin's loud wail has been featured in many films such as Tarzan and Harry Potter. We managed to add a little excitement with getting lost in finding the take out and a lot of excitement paddling the Class I and Class II rapids on the Aucilla River. Debby managed to go down one rapid backward, and Marion went for broke trying out a Class II rapid for the first time. It was so much fun that Mary did not want to miss the opportunity, and Chris even went down it for the second time. Also, Roselle managed the river on a paddle board with only a few minor scratches on the board from the rocks. Fortunately, nobody took a swim on this river except for Patrick. While the Aucilla River provided the excitement on the water, Econfina Creek provided spectacular scenery with its tall limestone edges full of ferns, wild flowers, and crystal clear springs. Easily, the Gainer Springs group is my favorite especially with the name. Still, our paddling adventures are about us being together as a family to share our paddling experience. I especially appreciated our time together at my home and Leanne’s place to share a meal. Together, we have managed to paddle from the Southern tip of Florida to the Northeastern side in the last four years.